This falls is named for its shape, sort of like the domed shell of a turtle. It spreads out and drops into a deep pool with a huge boulder overlooking it opposite the falls. That's the best place to view the falls from. Some people use the falls for sliding, and the pool for swimming. 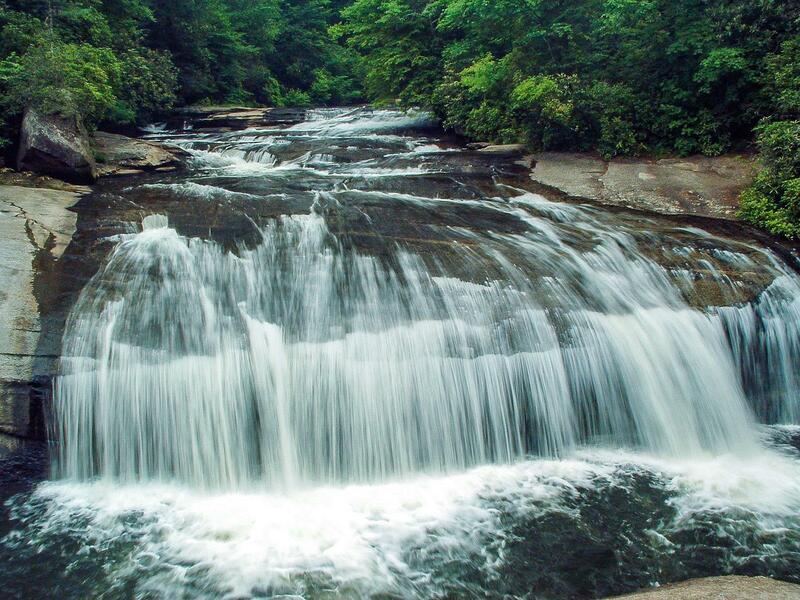 However, the water can be kind of dirty, the currents can be strong, and 150' Rainbow Falls lies just downstream. People can and have been swept all the way from Turtleback over Rainbow Falls. For that reason, I recommend staying completely out of the water at the Horsepasture River. Rainbow Falls - just below Turtleback Falls on this hike. Continue up the main path to reach Turtleback Falls. The trail climbs steeply as it winds up and around toward the top of Rainbow Falls. It's eroded in places, with steep side slopes eating into the trail surface. Use caution. The trail comes out at a point near the top of the falls. Many people go out onto the rocks near the brink, and it is a neat view. However, people have also died by falling from up here. Recently. Choose your actions wisely. The trail itself continues safely upstream, passing some nice churning cascades, and reaches Turtleback Falls in about 0.2 mi. A little side path leads to a boulder with a great front view of the rounded falls, which ends in a deep, churning pool. This is a popular sliding, swimming, and jumping spot. But you've seen what's just downstream, and people have been swept from here over the brink of Rainbow Falls. Recently. Again - choose wisely. Continue on the main trail, across a small bridge and tributary, to come out at a point on the sloping rocks above the falls for a view from the top. If the rocks are not wet, it's less risky to walk on them - otherwise, just stay on the little viewing platform at the edge of the woods.